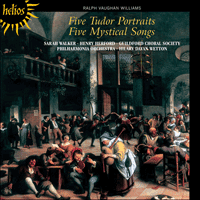 Vaughan Williams completed the Five Mystical Songs, together with the Sea Symphony, in 1911. He was by then almost forty years of age and had but a few years earlier (1908) studied with Maurice Ravel in Paris. Despite their disparate personalities the two musicians became firm friends and, although Vaughan Williams was later to make characteristically flippant remarks about catching ‘French fever’, in truth he learned much of value from the elegant Frenchman, a fact that he was only too ready to acknowledge. That he chose to study with a French master rather than follow the Teutonic studies favoured in his day shows a remarkable degree of discernment on the part of the evolving composer. He was rewarded with much good Gallic advice: to be ‘complex but not complicated’ apropos contrapuntal textures; he was taught to orchestrate in points of colour rather than in lines; also that formal development should be undertaken only to arrive at something better, never just for its own sake. Ravel was revealingly horrified to hear that Vaughan Williams had no access to a piano in the modest Paris hotel in which he stayed. Only with a piano, the French master explained, could one invent new harmonies. Such advice Vaughan Williams accepted with gratitude and he summed up his three months in Paris as a ‘new and invigorating experience’. Two of the English composer’s most loved and enduring masterpieces, On Wenlock Edge and the Fantasia on a theme of Thomas Tallis, followed his sojourn in Paris, and it was in particular the success of the latter which earned Vaughan Williams a new commission to write a work for the Worcester Festival. To fulfil this request the composer decided to complete the settings of five poems by George Herbert upon which he had been working for some time. The poet was himself a musician who associated music with a ‘divine voice’, a view totally in sympathy with the visionary aspects of Vaughan Williams’s art. Herbert died from tuberculosis in 1633 at the age of forty, his early demise the more sad since some of his poems are among the finest of the early seventeenth century. They are to some degree reminiscent of those of his great contemporary John Donne, even if they are less vivid and more intimate, a factor which, together with their ‘musicality’, tends to make a successful musical setting more attainable. The orchestration of the first two of the Mystical Songs owes something to the example of Elgar, and the opening song ‘Easter’ establishes the nature of the whole cycle, its ardent religiosity being combined with a wholly acceptable romantic inclination. The second song, ‘I got me flowers’, is a fine example of Vaughan Williams’s ability to express emotion with the simplest arrangement of notes, whilst the third, ‘Love bade me welcome’, has a muted string accompaniment that creates a perfect foil for the words. The use of the Corpus Christi chant, ‘O sacrum convivium’ as a wordless chorus set against the baritone soloist’s words ‘You must sit down … ’ is simply masterful. ‘The Call’, the fourth song in the set, uses a tune that might have come from the distant past but was in fact a typical invention of Vaughan Williams. Its modal treatment lends credence to its apparent antiquity and it provides a remarkable contrast to the ‘Antiphon’ that concludes the set. ‘Let all the world in every corner sing’ rings out with unequivocal conviction and, after its first performance, The Times reported that ‘the spirit of the words is reproduced with extraordinary sympathy, and the words themselves declaimed in a way which indicates a true musical descendant of Lawes and Purcell’.